The retail price is $16.95 for 124 pages. Sixty percent of the books we sell are PWS3’s. It is designed for one team level for one season. One for varsity, one for JV, etc. It begins with 6 detailed instruction pages. The front half of this book contains 52 pages of our Form B. Use one page for each dual meet or one page for each tournament round. The back half of this book contains 52 pages of our Form C. Enough for 26 wrestlers in up to 66 matches each. There are 2 pages of our Form D which is a season ending team summary form listing each wrestler’s totals. There are 4 pages of our Form E which is a spreadsheet format for summarizing up to 36 dual meets. 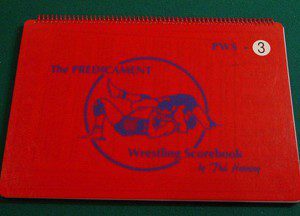 There are 4 pages of our Form F for summarizing team scores and wrestler placings in up to 16 tournaments. There are 4 blank, blue divider pages.